It is show time in the garden for those heavenly tasting greens. 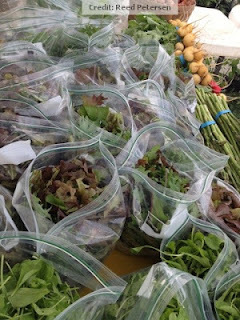 Lettuce, spinach, kale, mizuna, tatsoi, cress and arugula are our favorite greens. They are especially flavorful compared to store purchased greens. We have been told this by our customers many many times and they often ask why this is. Some customers have even gone so far as to do a taste test. There are several reasons for this amazing flavor. First we work very hard at remineralizing our soils. We add kelp meal, low magnesium lime, and highly mineralized salts. These minerals replace those removed from the soils over the years of farming activity. Second we use several inches of compost in each bed. The substrate for this compost is vegetable matter such as leaves and alfalfa hay that brings up minerals from deep in the soil. These minerals are maintained by the compost. Compost is not a fertilizer perse, but it does contain a nice amount of slow release nitrogen that is just right for light feeding greens. It is more of a soil amendment that feeds the microorganisms in the coil. A primary purpose for the compost is to provide a weed free shield for the greens to get ahead of any weeds that may be present. This makes for a low maintenance growing site. Third we harvest the greens Friday night right before market. They are extremely fresh for the market and that gives them incredible shelf life. We have had many customers tell us that they have been able to enjoy their salads for two weeks after purchase. The best way to get the maximum shelf life is to wash the greens you purchase and then spin or pat the greens free of moisture. Then put them in a zip lock bag with a paper towel to collect any residual moisture. It is the anaerobic conditions where drops of moisture collect that cause spoilage.